Collaboration establishes a new approach for teasing out clues hidden in the soil. Fabled as a site of biblical battles and spectacular palaces, Tel Megiddo today is a dusty mound overlooking Israel's Jezreel valley. It is also host to one of the hottest debates in archaeology — a controversy over the historical truth of the Bible's account of the first united Kingdom of Israel. 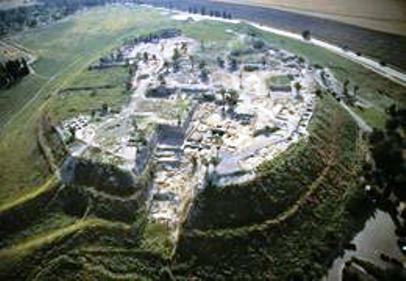 Ancient Megiddo is said to have been a key administrative and military centre in the kingdom ruled by King David and his son Solomon during the eleventh and tenth centuries BC. But the biblical narrative is challenged by archaeologists such as Israel Finkelstein of Tel Aviv University, who believe that David and Solomon did not rule over an Iron Age empire. Instead, they suggest, David and Solomon commanded a small and not terribly influential kingdom, and Megiddo's peak came nearly a century after the united kingdom had divided. 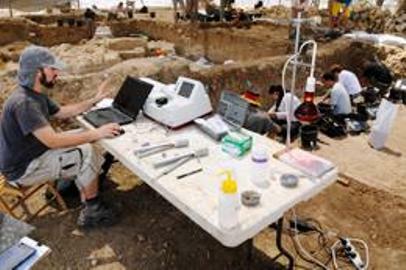 Important evidence relating to this debate is being unearthed by a unique collaboration between archaeologists and natural scientists, working shoulder-to-shoulder at Tel Megiddo and several other important Israeli sites. "In the past, all too often, archaeologists and scientists worked together, but it was two parallel lines," says archaeologist Aren Maeir of Bar-Ilan University in Ramat Gan, Israel. It could take months or even years before finds were sent away to the lab, he says, with results taking just as long to come back. "On top of that, sometimes the samples weren't taken correctly." The Tel Megiddo dig is different. Chemists make up half of the two dozen excavators on the team, which is being led by Finkelstein and Steve Weiner, a structural biologist specializing in mineralized tissues who is director of the Kimmel Center for Archaeological Science at the Weizmann Institute in Rehovot, Israel. Funded by a European Research Council grant worth €3 million (US$4 million) over five years, the pair hope that their work at Tel Megiddo and elsewhere will show that this model of close collaboration should become the norm for archaeology. Archaeologists are trained to use their eyes to identify a stratum — a buried layer representing a particular period of habitation. A black stripe, for example, might be a burn layer — evidence of a hearth, or of the ransacking of a city, depending on its size. Artefacts and pottery embedded in strata can also serve as markers for defining and dating them. But chemical analysis can add many more details to the picture. When Nature visited Tel Megiddo in October, excavators were working with brushes, tweezers and teaspoons to gather sediment samples into small plastic vials before taking them to an infrared spectrometer set up on a folding table at the edge of the site. The chemical clues yielded by the spectrometer gave immediate feedback to the diggers as they collected further samples. Chemical analysis can distinguish between soil layers that look identical to the naked eye, explains Weiner. In a paper published this month, for example, he and his colleagues show how infrared spectrometry can reveal the distinctive origins of seemingly identical layers of calcite, a form of calcium carbonate (L. Regev et al. J. Archaeol. Sci. 37, 3022–3029; 2010). Wood burnt at above 500 °C produces calcite, although the mineral can also come from limestone slaked to make lime for construction, and is found in the soil used to make mud bricks. Each type of calcite has a distinctive infrared signature, providing information that helps archaeologists to distinguish between a floor, a wall or a kiln. In another part of Tel Megiddo, Weiner points out a layer rich in a form of silica (SiO2) that accreted in and around the cells of plants. These 'phytolith' layers mark locations where vegetation grew or was stored. Weiner and his team have calculated that the layer, now just 3–5 centimetres thick, was originally a metre or so deep. Their first assumption, based on similar findings in other locations, was that the area had been used as an animal enclosure. But an analysis of the phytoliths showed that they all came from domesticated grasses. Because the dung of grazing animals would be expected to contain a high proportion of wild plants, it seems possible that the phytoliths are evidence that animal fodder or grains were stockpiled at the site. Experts in radiocarbon dating, who usually stick close to their laboratories, are also getting their hands dirty. Elisabetta Boaretto, a nuclear physicist at the Weizmann Institute, is a regular participant in digs, where she can be seen on her hands and knees scraping up samples with the rest of the team. "I'm one of the few, if not the only one, in my field who's down in the pits digging," she says. "But it's essential." While digging in the southeastern area of Tel Megiddo, Boaretto's PhD student Michael Toffolo unearthed a pottery storage jar full of grains of wheat. After carefully photographing and noting the context of the find, he collected kernels in a vial so that they could be sent abroad to a particle-accelerator facility for dating. Boaretto is currently shopping for a particle accelerator for her lab at Weizmann. The machine, expected to cost about $2 million, should be ready for radiocarbon dating work in 12–18 months. Having an accelerator near to local excavation sites will help to yield results much more quickly, says Boaretto, and her team will be able to supervise samples at every stage from the dig to the accelerator, preventing contamination that could otherwise cast doubt on the analysis. Boaretto explains that she is on site because an understanding of precisely where samples came from is key to getting the most accurate dating. For instance, wheat grains and pieces of charcoal are often used to date pottery shards found in the same spot. But without seeing the stratigraphy, it is all too easy to miss evidence that the grains or chunks of burnt wood found in a particular layer actually originated elsewhere, making them useless for dating neighbouring samples. And if the carbon sample removed for analysis actually contains material from more than one source, it can throw the dating off completely. Having scientists on site can help archaeologists to make faster decisions about where to excavate and what samples to collect, and, ultimately, yield more useful analyses. "Scientists in the field may come up with different questions than archaeologists," says archaeologist Joseph Maran at the University of Heidelberg, Germany, who specializes in ancient Greek sites. "It's different from having an archaeologist define the question and then call in a scientist to address that specific issue." Maran says that the practice of having scientists actually excavating with archaeologists is, to the best of his knowledge, a uniquely Israeli phenomenon. As a small country rich in archaeological sites and with a strong science base, it may be much easier for Israel's scientists to spend extended periods at excavations than for those in other countries, he says. But Weiner hopes that the collaborative approach will catch on elsewhere. Earlier this year, he published a book, Microarchaeology: Beyond the Visible Archaeological Record, about the union of archaeology and analytical science, which he hopes will inspire other digs. In the past, few scientists have been willing to spend a large amount of time in the field, Weiner says. The key to making the collaboration work, he says, is "matching the right analytical tool to the challenge of revealing the microscopic record without slowing the excavation down enormously".